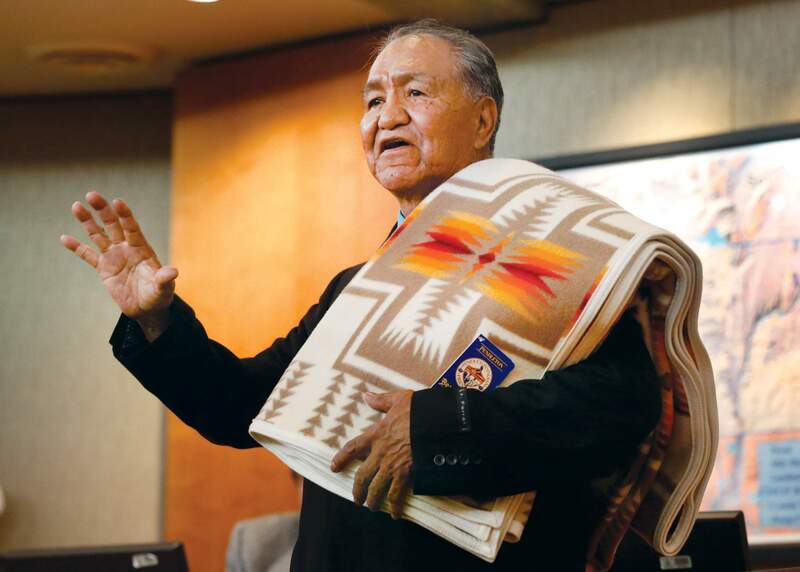 Clement Frost, a two-time former Southern Ute Indian Tribe chairman, said, “We need to ask how can we better help members,” to those gathered for the swearing-in ceremony at the Leonard C. Burch Tribal Administration Building in Ignacio. IGNACIO – After a six-year absence, Clement Frost is back on the Southern Ute Tribe Council – as chairman. Frost, who served as council chairman from 1997-2000 and from 2005-2008, was the dominant candidate in a field of six. In a special election Wednesday to fill the seat left vacant by the death in March of Jimmy Newton. Jr., Frost received 130 of 394 ballots cast. Second place went to Jocelyn Dutchie with 80 votes. A regular election is scheduled this fall when two of six Tribal Council seats must be filled and the chairman’s seat again is up for grabs. A two-hour swearing-in ceremony Thursday included a blessing, the oath of office administered by Chief Tribal Judge Chantel Cloud, good wishes and gifts from Ute Mountain Ute and Northern Ute representatives and floor speeches by Southern Ute Indian Tribe members. The Ute Mountain Utes presented Frost a bolo tie adorned with bead work. The gift from the Northern Utes was a woven blanket or serape in which red, orange, brown and white predominated. Mayor Sweetie Marbury was the messenger sent from the city of Durango. Frost, dressed in a dark suit, turquoise-colored shirt with a bolo tie, took his seat, received recognition as leader from chairman pro-tem Mike Olguin and the welcomes and pledges of cooperation from the other council members. Frost announced the jobs of three Jimmy Newton Jr. appointees, two executive officers and a media coordinator, were terminated immediately. Also, he announced that council member Mel Baker would be his second aboard and Michelle Olguin would be his executive officer. In his address, introduced with a few words in Ute, Frost said the tribal administration has failed its members and left rank-and-file employees “walking on eggshells” fearful for their jobs. Comments from several members of the audience sounded similar concerns. A man said the Utes are the tribes that have struggled most, and they are the tribes most regulated by the U.S. government. “We must break away from the U.S. government and run on our own,” he said. A woman said the wealth disparity between the revenue-producing arms of the Southern Utes and tribal members is crushing and demoralizing. Another woman said someone has obtained the right to film the annual Southern Ute Bear Dance that took place last weekend and sell the production for profit. “They’ve shut the door on us,” she said.